I�ve recently completed a project to add all of the public libraries in the United Kingdom to the lib-web-cats database, including data on the automation systems that they use. The database now includes entries for 210 library authorities in the UK representing a total of 4,184 individual libraries. This project reveals several characteristics of public libraries in the United Kingdom versus those here in the US. One of the key differences involves the higher degree of support each government authority gives to its libraries. Some authorities cover counties, other boroughs or municipal areas. Each local authority provides a variety of services to its residents, including a library service. After going through the Web sites for dozens of UK authorities, I�ve learned that the library service tends to be organized within a larger agency for leisure and culture. Each authority includes a large number of facilities in its library service�an average of about 20 each. In addition to the permanent facilities, most library authorities also offer mobile libraries and delivery services for the homebound. Each authority maintains a library services that provides an automation system shared by all the libraries within its jurisdiction. This arrangement gives even the smallest of libraries in the most remote villages access to top-of-the-line automation systems. In the US, many libraries in small communities can afford only the lower-level PC-based automations systems and a very large percentage have no automation system at all. I was able to identify only four UK libraries with no automaton system. It�s also of interest to note that almost all UK authorities maintain Web sites based on some kind of content management system, or e-government portal. The sites are well organized and present pages with consistent layout and design. The library automation environment in UK public libraries involves a much narrower range of companies than here in the US. Two UK-based companies provide library automation software to the largest portion of libraries: DS supplies its Open Galaxy software to 64 library services including 1385 permanent facilities or 33 percent of the overall share. Talis supplies Alto to 57 library authorities including 1168 facilities, representing 28 percent of the market. SirsiDynix provides Unicorn to 21 library services, Dynix to 19, and Horizon to 9. Concerto, now owned by ISACSOFT, continues in 4 library services. While still holding a minority share, Vubis Smart from Infor and Spydus from Civica are gaining momentum in the UK. No project like this is ever really finished. I anticipate that I may have missed some libraries and several library services will be moving to new systems in the next year or so, especially those that continue to use legacy systems such as Dynix, Horizon, Liberate, and PLUS. Last month I gave a presentation at the Talis Insight conference in Birmingham, UK titled "Working toward a new generation of library automation: opportunities to break free from the traditional mould.� Delegates to this conference included wide range of UK librarians, including a large representation from libraries beyond the customer base of Talis, the company that organized and sponsored the conference. I was asked to give an assessment of the current state of library automation and to offer some ideas on future directions that libraries might think about in the next generation of library software. I personally vacillate between seeing the future of library automation continuing its steady evolutionary pace versus making a fairly major shift. In this presentation, I explore some opportunities available by diverging off the evolutionary path. Tim Buckley Owen authored a great summary of my presentation which appears on the cover of November 30 issue of Library + Information Gazette published the Chartered Institute of Library and Information Professionals. Tim Buckley Owen reports on a radical view of the future from library automation specialist Marshall Breeding. People are "less than happy" with the current choice of integrated library systems (ILSs) , which consists of mature products that are approaching the end of their life cycle, suggests Marshall Breeding, Director for Innovative Technologies and Research at Vanderbilt University Libraries in Nashville, Tennessee. Developers don't seem to be having much luck with new ones -- and the old ones don't age as well as wine. Breaking out of the current mould was the theme of Marshall Breeding's presentation, to a packed audience, at information and library management technology company Talis's Insight Conference in Birmingham earlier this month. Existing monolithic systems are less and less in tune with user expectations or the way 21st-century libraries work, he believes, and big changes are on the horizon. Consolidation among providers has resulted in "an uncomfortable narrowing of options that are available to libraries". There's dissatisfaction with the commercial offerings and with closed source systems � and it's throwing up opportunities for the open source community. It's all come about because there's too little innovation at present. 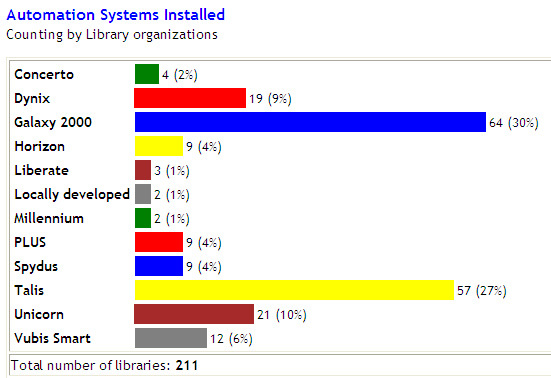 "How many of you believe that your library automation system gives you everything you need?" he challenges. "Is it cooler than your iPod?" However, it's pretty tough to ditch your existing system unless you're forced to � and forced migration is relatively rare. You get a bad fundholder reaction if you want to buy a new system, he acknowledges. There are better things to spend your money on � new interfaces for library users, federated search. The world is less ILS-centric now, he suggests, and there are plenty of companies that are in library automation but not involved in ILSs at all. Open source alternatives to commercial systems are becoming more of a practical option. However, open source is not cheaper, he warns. What you may save on acquisition costs you spend on more local support. The open source market share is minuscule at the moment, he acknowledges. But it will grow over the next three to five years, and be a catalyst for further developments, not least because it will present formidable competition for the commercial providers. There will be no real 'traction' until open software has a real impact on the commercial systems, he suggests. But, when it does, what should emerge should not be more complex, but simply more robust and functional. Take inter-library loans; they're not well automated at present. Existing systems simply don't reflect the way libraries operate today. However, we don't want to create a new monolith; what we need is a suite of interoperable modules. A more lightweight approach is required, because existing systems are in danger of collapsing under their own weight. Current systems are too compartmentalized. Why, for example, handle physical and digital materials separately? Why focus on the online public access catalogue (Opac)? It doesn�t cover online articles; it's only a small part of the system. We need more service-orientated architecture, more applications for the libraries of the future. This means more interoperability, including meshing in with global resources such as Google Scholar. We must exploit global interfaces to drive users towards library resources, he continues�using the search engines to get into our own collections. With such a model, I he challenges, do we even need our own OPAC? We're actually moving into a post-metadata discovery is done world. Library resource Discovery is done through the actual searching of the digital objects themselves. Users are underwhelmed by what they find on library websites, compared with well-engineered and funded services like Amazon.com, he believes. The old marketer versus consumer relationship between vendors and libraries is not helpful any more either; partnership is what's needed. "I feel like we're behind," he concludes. "If we don't do things quickly, we're going to get further behind." Although my visit to the UK for this conference was very brief, I really enjoyed a chance to talk with librarians from the UK and to learn more about library automation in that part of the world.